« It’s No Longer Possible. For this Ministry this is a huge emergency. Our largest boat is on dry dock in Turkey and will go back in the water tomorrow. 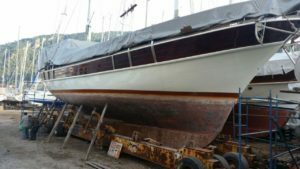 Because of bad weather and motor conditions it arrived in Turkey in terrible condition, the cost for repairs on arrival was 33,500 Euros; we paid 14,000 leaving a balance of 19,500 Euros for repairs and dry dock fees. In addition of that we now must pay a years mooring of 8,000 Euros. All this is due May 1st and it will take a miracle for us to make this payment. The Devil knows Jewish lives may depend on this boat being ready in the coming days, and there is nothing he wouldn’t do or hasn’t done to destroy Jewish lives. The Devil is defeated when we stand together in God’s love and in His Word Yeshua, and it’s now that time I have never written a more urgent request to the Believers God has placed with this Ministry. It’s praying time and sacrificing time. It’s now up to the Body in Yeshua God has gathered together for this Ministry, I can now rest in God’s leading and promises. This is short and to the point it’s urgent, very urgent, I’ve been stressed and didn’t want to send this report out but have no choice, you must know how serious this is.